So here’s a question… Has life really changed since matchmakers were a thing? Although I hear that matchmakers are still a thing. 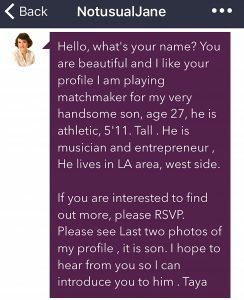 Isn’t JDate its own kind of cyber matchmaker? 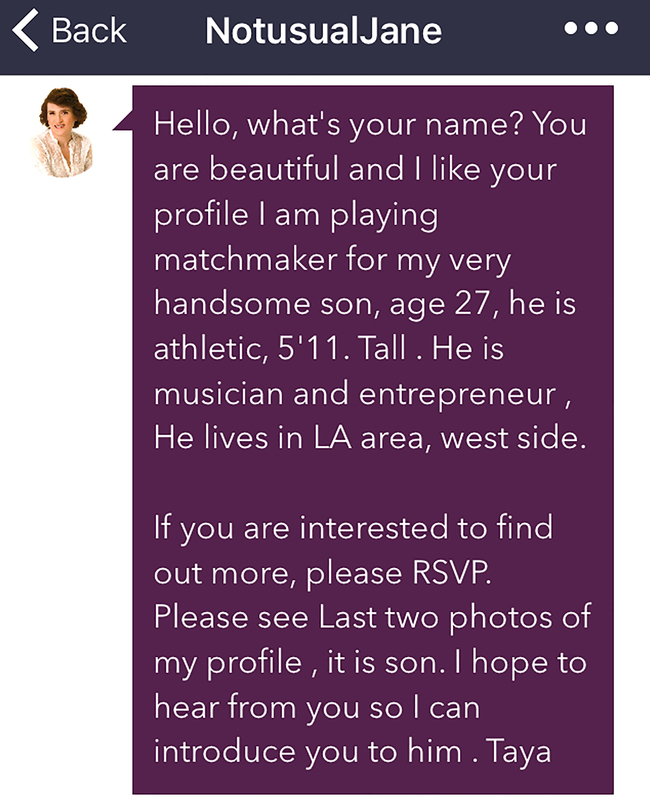 Matchmaker Mom is on JDate scoping the wares for her son. I find that really funny. And maybe that’s what I should have been doing for Shira, if I were really a committed mother dedicated to helping my daughter find true love. Clearly I’m slacking off in my mothering duties. And Matchmaker Mom has called herself “NotusualJane.” Clearly she knows it’s not usual to be making matches for your children. Doesn’t she?? I then showed Shira Crossing Delancey because it’s about matchmakers and dating, and even though it takes place in the eighties, it’s still pretty on target. Although maybe 30 years later there aren’t any more pickle men–I wouldn’t know, not living in New York. But the movie is about looking in the not usual places to find your soul mate. Or maybe looking in the usual places that you are resisting. For Shira, that has turned out to be in a DnD session–the best friend of her friend’s little brother. She and her current beau are very happy together. For me, well, I’m still halfheartedly looking, both in real life and on the apps. But maybe I’m not exploring all the options. Maybe I need to start looking in LA. Maybe I need to start playing DnD (according to Shira). Or maybe… Mom, you want to help me out here? This entry was posted in dating, Love, Simplicity and tagged dating, love, soulmates. Bookmark the permalink. Oh that’s funny! I would be suspicious of this message, if she were still looking, but that’s just how I roll. Why would a mom be looking for her son? I would expect that, if Shira responded, there would be no meeting (if at all) until she paid “the mom” something. I could be wrong. That said, I love Crossing Delancey! I own it and watch it every once in a while. What a cute movie, with a great message for daters too. Many of us have in our minds some “ideal” that no one can actually meet and we’ve likely overlooked some great people. I’m sure I have. But ultimately I found dating sites too frustrating for me and the way I would like to get to know someone slowly, building up trust and friendship, hoping to find something long-term. For a vast number of men, the sites are just a place to find hookups and it’s depressing to try to filter them all out.